I liked the original paintings in our room in our Mykonos hotel, Villa Pinelopi. At least they looked like originals, but maybe they were facsimiles. In any case, their simplicity and bright colours were appealing, even seemed quite brilliant to me. They also remind me of urban sketches, except they are paintings. They were signed only “Karolina” in the Greek alphabet, and there is a little bit of information about her online when I googled “Karolina Mykonos artist”. Born in 1939 in Boston as Carol Wells, she would be 74 now. These paintings inspire me to pick up a paint brush and a canvas, start painting, and not make a big deal of it. I finally had a frou-frou drink, as overly colourful and decorated concoctions are called. There wasn’t even alcohol in it, really just the frou-frou. The Kastro Bar is a 38-year old gay bar in Mykonos, fondly remembered by my friend L. who used to hang out here. All four of us had a drink here earlier in the week and L. was happy once again that nothing had changed. We discussed how the North American mantra seems to be to change things up all the time, even if something’s working well, because there might be an even better “business model” with more profit to be made. But there is something to be said for leaving things as they are if a business is providing a living. The Kastro Bar owner is clearly content to keep his bar’s character intact. Today I went back here on my own to draw. But I sat outside the bar on a little plaza flanked by at least three small churches. The young waiter was beautiful, but he was only batting his long eye lashes at men. The bar tender came out to look at my sketchbook, then he sent the owner to say hi. They showed me their new drawing exhibit of Mykonos doors inside the bar. Inside, this bar is a wonderful place. Part of the Little Venice area of Mykonos, the bar room hangs out over the sea. Only classical music plays. The large west-facing windows are filled with golden light in the evenings and the ocean view. People here are quiet, almost reverential to this view and atmosphere, it’s a small room, and as L. pointed out, anyone who sits on the benches right at the windows turns beautiful as they are bathed in a golden light. 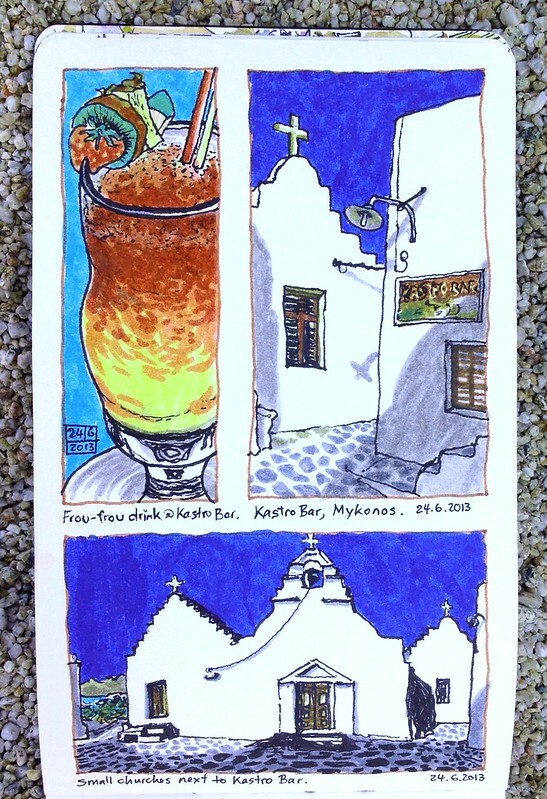 Since I had so much fun on my first solo Mykonos sketching day, I took another day off from my travel companions. 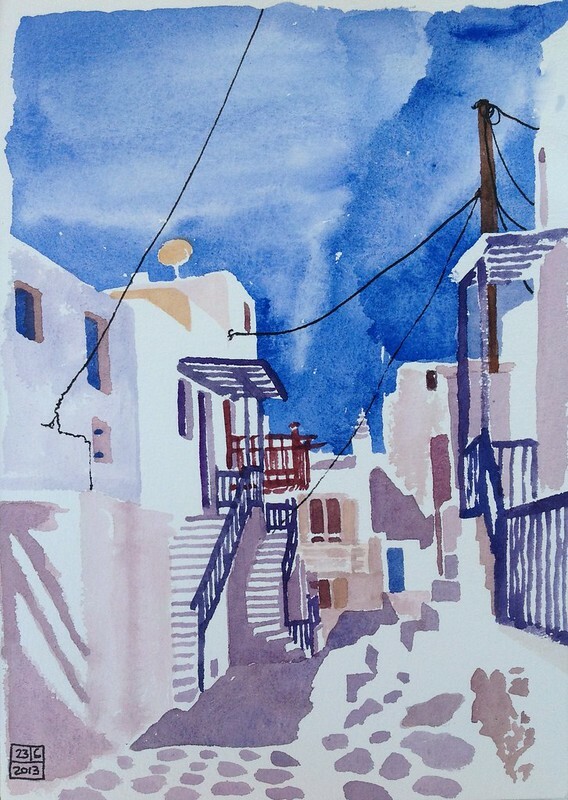 I skipped the beach in favour of meandering through the maze of narrow streets that is Mykonos. Mopeds can still go through even the tightest spots, and they will. Even cars and mini trucks get into some places that we North Americans would not dream of attempting to drive through. An old man with a cane very slowly walked through my drawing just as I was finishing, as if on cue. His extremely slow speed allowed me plenty of time to capture him. I half stood, half sat on a slanted ledge to draw this, I really had to press against the white washed walls to stay in the right position for this view. When I was done, the seat of my beige pants had turned chalky white. 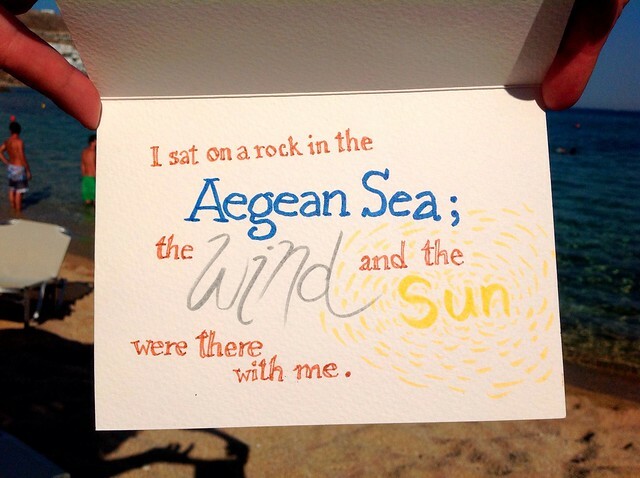 Those traces of chalk may be my best souvenir of Mykonos. My friends asked me to sketch them a handsome man that they spotted. So I did. I need a bit more guts and practice to draw people on the fly anyway, and why would I object to practicing my male model drawing? He may well be one of those Greek gods I wanted to look for, although L., who is Italian, insisted that he was a Roman god. Plenty of Italians are here, and making a bella figura. 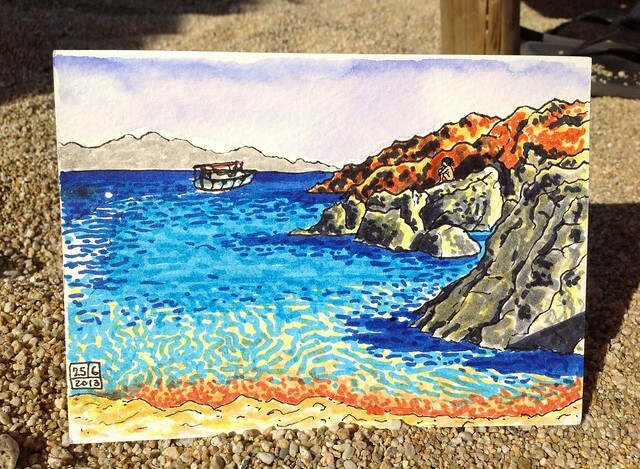 On a colour note, I had to use my Aegean blue and turquoise felt pens to colour the sea, because I am basically out of blue in my watercolour kit, and there isn’t a proper art supply store here on Mykonos, I already asked around. I am not usually a beach person, but willing to learn from my friend L. who is. I can easily handle beach time for several days in a row but I wear sun block, stay mostly in the shade or wear a long sleeve shirt. And the doing nothing aspect of beach time is something I need to practice more. We tried out a different beach today in an attempt to get away from the wind: Psarou Beach. The wind blowing sand at us was still a bit much, but there was a simple snack bar at the back of the beach where I could sit with a glass of Retsina and had a perfect drawing surface and view. Next to the simple beach we were on, are the high end beach restaurant Nammos and Psarou Beach Hotel which has cushy lounge beds you can rent for €30 a day, all the way into the water. Dignified-looking waiters were delivering champagne buckets, towels, trays of €15 frou-frou drinks and there was a sushi bar at the beach. They played music, fortunately relaxing light jazz, which drifted over to us. That turned into a more up-tempo but still pleasant lounge music in the early afternoon. At least the place was tasteful. We found out it’s a long weekend in Greece and a lot of people fly over to Mykonos from Athens. Giant yachts pulled up in this bay, unloading more revellers. These were mostly rich Greeks partying near us, with Italians being the next most represented group. I have not noticed any signs of the tanking Greek economy here in this rich little enclave that is Mykonos.